Like many cities around the world and in the history of civilization, the city of Richmond was born and grew along a major river. 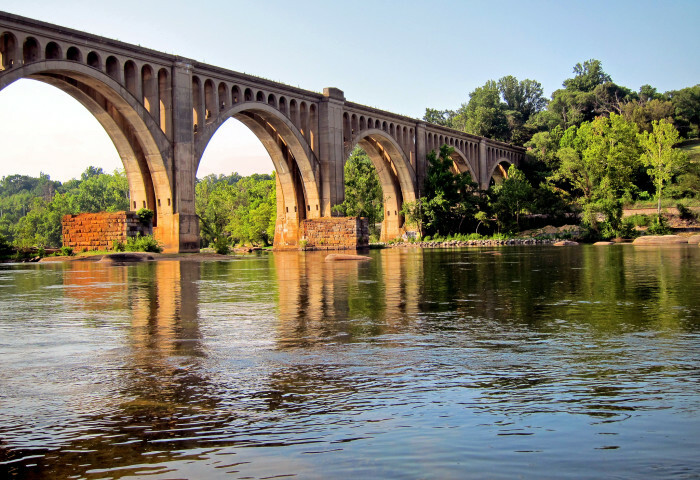 In our case, it is the James River, one whose course falls entirely within the Commonwealth of Virginia. The James has played an important role in our state’s and nation’s history and continues to be a centerpiece of activity, culture, and general life for the city and surrounding areas. One of the man-made features of the river is a beautiful, classic railroad bridge, spanning the river just west of the downtown area. Built in 1919 and still in use today, the CSX A-Line Bridge carries a double track and was built jointly by two rail companies. Its purpose was to create a more direct and, therefore, quicker route around Richmond. It crosses over sets of tracks on each side of the river and replaced an 1891 bridge whose brick piers are still standing in the water. If you’re driving around Richmond, we hope you will take a good look at it and see the organ console. It runs parallel to the Powhite Parkway (VA route 76) bridge on the downriver (east) side.